Tom Pinch is a professional gallery and commission artist living in Southern California where he was born and raised. He is largely self-taught. He creates both Impressionistic and Representational original art. Working in oils, he approaches each individual work of art from a fresh perspective. His paintings have been exhibited in collections throughout the world, including the United States Golf Association Museum in New Jersey. It is there where Pinch's 40"x30" portraits of both Tiger Woods and the late PGA Tour player Payne Stewart hang as two of only 35 curated portraits in their exclusive permanent museum collection. His impressive client list (see partial list below) includes many corporate commissions as well as private commissions. His client list continues to grow along with the desire for his artwork. In 2006, he began creating fine art gallery works in order to reach a broader spectrum of collectors as well as to reach his full creative potential. Although still an active commission artist, his gallery paintings featuring subjects of his choosing has since become his main creative inspiration and focus. 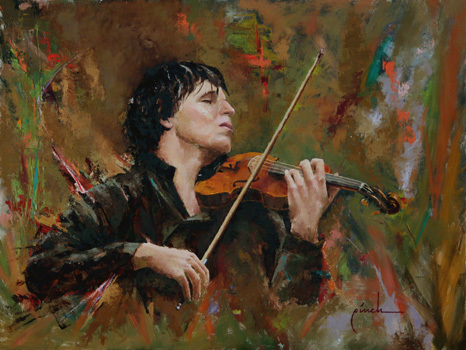 "By carefully studying the work of artists I admire along the way, I charted my own course in artistic training. My deep affection for loosely-rendered Impressionistic and Representational art, and my sheer determination to produce it at the highest level, have prevailed as an ideal formula for artistic success. I continue to challenge myself both compositionally and technically to consistently create paintings that are thought-proviking and fluid." "My style involves balancing elements of realism and impressionism into meaningful works of art that satisfy my collectors and admirers. One of my goals when painting is to create the 'illusion of detail' so that each viewer will interpret the visual information in ways that are unique to them. I want to stimulate the imagination of those who view my paintings - not spoon-feed the information to them through a academic and highly detailed rendering of the facts. Instead, I want to 'engage' my viewers and make them a part of the visual experience." Course Designer: George C. Thomas Jr. Course Designer - George C. Thomas, Jr. Course Designer - Robert Trent Jones, Sr.
TRANS-PACIFIC LINKS COMPANY JAPAN, LTD.